Muzhappilangad Beach is known as the Drive-In Beach as the motorists flock to practice their session here without taking much of the risk. 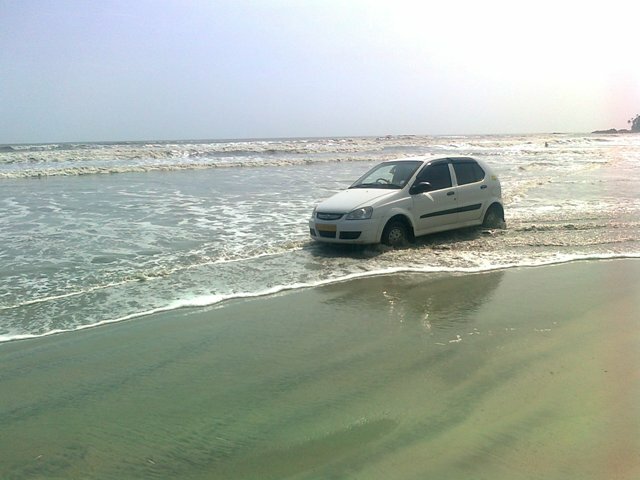 Here one can drive entire length of 4Km on the sandy beach and it is one of the longest Drive-in beaches in Asia. This beach runs parallel to National Highway NH-17 between Thalassery and Kannur in Kerala state. Muzhappilangad Beach is one of the popular and unique beaches of Kerala and gives a unique experience to the visitors. Muzhappilangad is a serene beach and the beautiful atmosphere enchants the visitors for spending day as well as evening. One will not find many of the shops or vendors roaming on the beach which creates a clear drive-in space for the motorists. A drive on the beach is a wonderful experience and without much of the fear one can prepare stunts here on this beach. Due to the firmness of the sand, it is a great place for driving. The beach is a natural retreat for the evening walkers as well. During low-tide one can walk to Dharmadam Island, located about 100 metres off the shore. The island is a great place to enjoy the beach as well as greenery amidst water. It is a privately owned island and the tourists need permission to reach the island. The natural beauty of the island can be enjoyed during low tide and one can reach the island on foot. The high tide demands boat-riding to reach the island as it cannot be accessed on foot. The sightseeing of the island attracts many of the tourists and it is one of the mesmerizing views that nature bestows to this beach specifically. The natural surroundings, the calm atmosphere, the long stretches of sand and the cool air blowing in the evening time are some of the natural treasure one can discover on this beach. Apart from the sightseeing and biking, one can enjoy some of the water activities on the beach. This place is a great place to enjoy swimming, take a sun bathe, or surf in the water. Though much of the water sports are not enjoyed on this beach, it is a great place for swimming and surfing. The beach festival held during April is a major tourist attraction every year. This festival attracts many of the bikers and motorists to try stunts. Experience this festival leaves many filled with joy and happiness. This festival is considered to be one of the major events in the Kunnur district. Staying for few days on the beach brings amazing experiences to the tourists during winter. The ideal time to visit the beach is from October to April. One can find many budget and mid-range hotels and guest houses near the beach. Within 1km of distance, the accommodation is quite affordable. One will not find any luxurious stay near the beach. There also one can get the sea food in the shacks located in the nearest area of the beach. The beach can be accessed through rail route and air. The nearest railhead is Thalassery and Kunnur which are located at a distance of 7km and 15km from the beach respectively. The nearest airport is Kozhikode international airport.